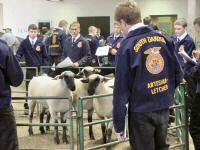 Production Career Development Events - a special project of the South Dakota FFA Foundation, Inc.
Sponsorships for Production Career Development Event awards are $200 per event. This covers plaques for the top three teams, pins for the top ten individuals and a plaque for the high individual in each event. Travel Scholarships are provided for for State-winning teams and individuals to compete at the 2018 National FFA Convention. Dairy Cattle Evaluation and Management CDE Production CDE SD Div. of the Midwest Dairy Assn. Dairy Cattle Evaluation and Management CDE Travel scholarships Sharp's Inc.
Food Science and Technology CDE Production CDE Valley Queen Cheese Factory, Inc.
Livestock Evaluation CDE Travel scholarships Dakotaland Feeds, Inc.
Meats Evaluation and Technology CDE Production CDE John Morrell & Co.
Meats Evaluation and Technology CDE Travel scholarships John Morrell & Co.
Vet Science CDE Travel scholarships Mike McIntyre, D.V.M. Veterinary Science CDE Production CDE Mike McIntyre, D.V.M.